Individual occurrences of vampire characters in series that do not regularly feature them. Series and miniseries that regularly feature vampires. Made-for-TV movies, and pilot presentations that are not considered part of a series. Lists all cartoon and anime programming where vampires are found. 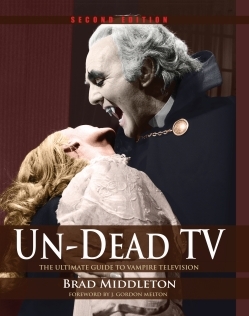 Factual programming and unscripted television series that feature the undead. Talk shows; sketch comedy; television specials; children’s programming. Energy drainers, succubi, and other vampire-like creatures (from all categories). Take a Breather: No Vampires Here! Catch-all collection of productions thought to feature vampires which do not. The vampire myth is universal; these productions come from several foreign countries. Interesting facts and statistics compiled during the research and review phase.